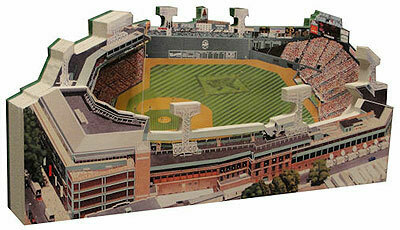 Made from multiple layers of compressed wood, the 3D model of Fenway Park accurately replicates its quirks and exactly matches its look as precision cut photos are put on each piece of wood, which themselves are die cut to match Fenway's unique features and layout. The closest thing to the real thing that you'll find, the Fenway Park model is three-dimensional thanks to its layered wood design, which gives the optical illusion of a 360° replica from only a few feet away. You can also learn a little more about "America's Most Beloved Ballpark" on the backside of the model, which has a recap of Fenway's history and most notable features. Size: 9" x 4" x 1.125"
The display case has an acrylic top that fits into grooves in the black texturized composite base. The case actually magnifies the Fenway model's 3D effect and felt dots on the bottom of the base ensure it stays in place and doesn't scratch surfaces.